Let us look at some of the basic aspects of a gaming monitor. Refresh rate determines how many frames that monitor will show per second. If it is more in number, like 144, then the motion will be expected to be smooth with no blur. Response time on the other hand is the time it takes for the command to process on the screen after you have given it on the keyboard. For gamers, time is everything and if the response time is less then they will be able to better control the chances of winning and/or loosing. Addict and professional gamers whenever play game; it is never for an hour. The minimum times they spend in one go is at least 3 hours and with this much exposure to the screen, there are a lot of chances for him/her getting eye strain or the eyesight being affected. Some gaming monitors therefore have eye care technology that reduces the blue light. Video games may be set in day and at times, during night as well. Night modes are dark and due to this reason, the black equalizer feature lets the user access dark areas and even the hidden objects. Lastly, multiple viewing angles further enhance the gaming experience. Monitors are generally considered to be more suitable for playing games, compared to TV screens. The graphics and display of monitor is suited for the game plays whereas on TVs, the resolution, response time and overall graphics are relative to the ordinary cable channels. Brands like BenQ, LG, Philips and ASUS have managed to come up with monitors that exclusively fulfill all the gaming requirements and that too in an affordable price. Since gaming monitors are high end and manufactured with a purpose, due to this reason they cannot be priced extremely low but still brands have kept it in a medium range. The detailed product analysis below is of all those famous brands which have their gaming monitors under 300. This will surely help you decide which monitor to buy if you are a dedicated gamer. One of the latest and great gaming monitor under 300. This 27 inch gaming screen is all what an addict gamer would want. Response time of 1ms is ultra fast and ensures a lag free gaming time. It has a full HD display, 1080p resolution and the black equalizer makes it easy for the user to spot darker areas in light and look for hidden things, which are otherwise difficult to locate in darker scenes. It is used by a number of professional gamers and support famous video games like FIFA, HALO, COD and Tekken. The frame is designed in a way that visual distractions are minimized and the low light technology helps to reduce the eye strain that usually get while continuously playing. It is a very user friendly product with built in speakers and a number of input ports like HDMI, DVI and headphone. Responses from customers were overwhelming; the response time and display graphics were what they most liked. Some of them even said that after buying this monitor their performance improved by a great deal. The only small issue they faced was with the speakers as they weren’t able to give a clear audio. All in all, 79 percent of the users gave it a full 5 star review, whereas of the remaining, majority gave it a 4 star review. Slighter higher than $300 mark, but still worth looking at. 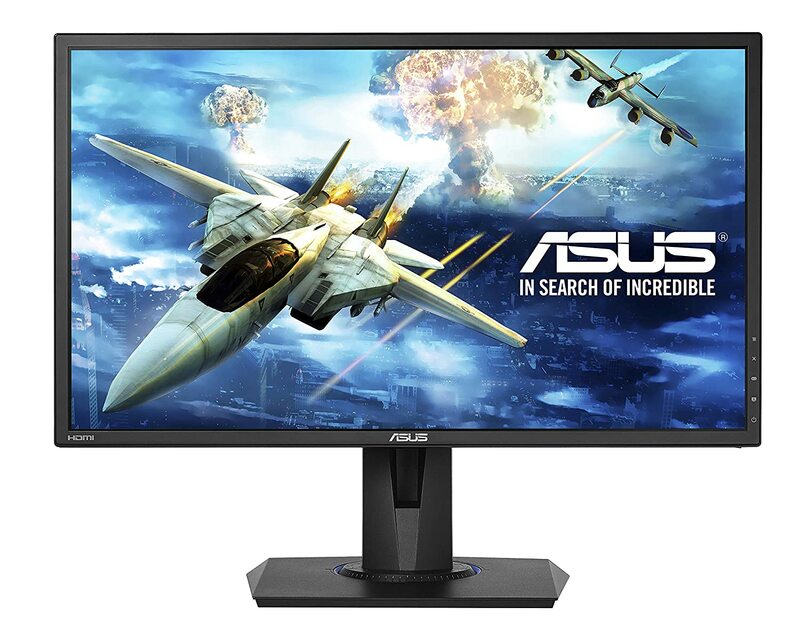 Asus has manufactured a 24 inch screen exclusively for gamers, to enhance their gaming experience. It comes at a price of above three hundred bucks above. A special eye care feature is there to protect their eyes from strain, as it is very common for gamers to spend continuously 3 or 4 hours sitting in front of the screen. Response time of 1ms is fast and ideal for smooth and error free gaming. The overall look has a very sturdy feel and along with the stand, it becomes ideal for placing it anywhere in the house or even at work. It has a refresh rate of 144Hz and full HD display. The built in speakers have great sound and are fit for the audio that is required in games. The users were extremely satisfied with all the features that are being offered in the stated price. The color display was good enough, keeping in mind that it was a gaming monitor and surprisingly no one had any complaints against it whatsoever. Even though few people used it, but those who did all of them gave it a full 5 star review. 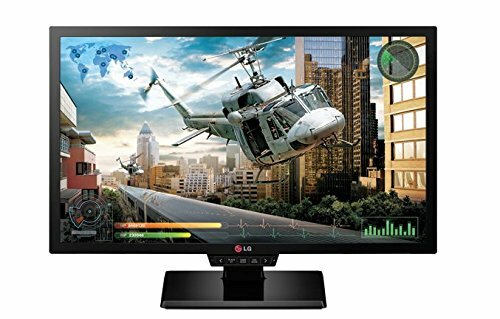 LG is a renowned brand when it comes to technology related products and it has yet again proved the lead by manufacturing this 24 inch LED screen gaming monitor. This monitor is available at an affordable price of just under $300. With a striking resolution of 1920 x 1080 pixels and quick response time of 1ms, users will definitely enjoy their uninterrupted gaming experience. LG has a black stabilizer feature which covers dark scenes in depth and allows user to see them clearly. Furthermore, there are 3 gaming modes to choose from depending on user requirements; two first person shooter modes and one as the RTS preset mode. Along with this, there is a base stand which is elegant and strong both, to ensure that the monitor stays in its place and can be tilted to different angles. Dynamic action sync is there so that the user doesn’t miss a single action moment. The users were happy with the color accuracy and the fact that unlike other brands, this one supported a USB port. Some customers complained that they were not comfortable with the TN panel and that it was not fit for professional use. But, keeping in mind the fact that it is only built for gamers explains the TN panel choice and its functionality. Apart from this, a good 76 percent of the users gave it a full 5 star review and among the remaining, most of them gave it a 4 star review. On the whole, LG did a pretty good job with this. 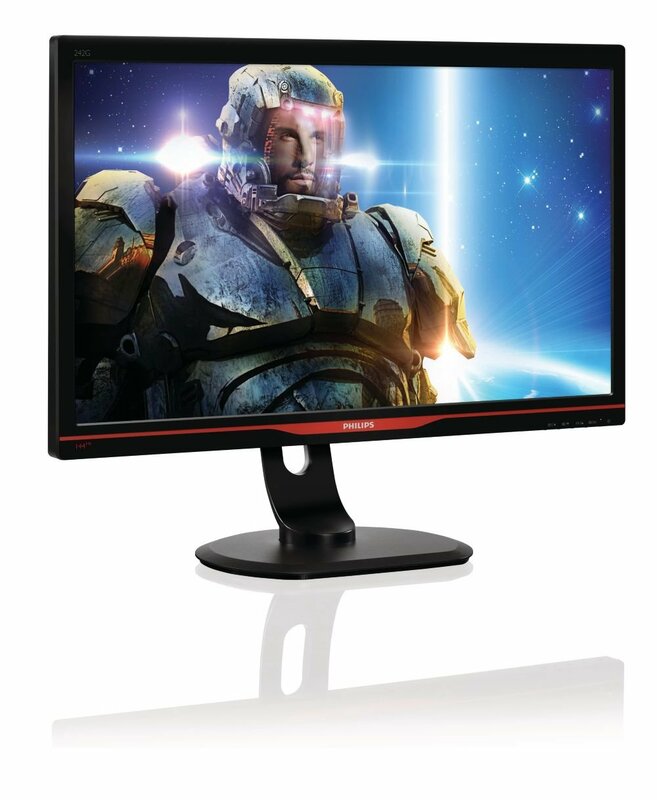 One of the pretty reasonably priced gaming monitors under 300. Compared to other gaming monitors, this one by Philips is affordable at a price of much less than $300. It offers brilliant images and also increases the visibility of dark scenes. Gaming is made much smoother and will not be interrupted a bit due to the fast response time. With 144Hz frame rate, even the minute of details are shown on the screen which enables the user to play much more closely. Users can also specifically bring their curser to desired areas and lighten the dark scenes to spot hidden elements in games. Smart keypad is a special controller which is designed for this monitor which allows the user to quickly access all game modes and settings. Multiple ports can easily be connected to this including the HDMI, VGI, DVA and USB of type 3 and 2 both. Customers were happy with the vibrant and crisp display along with a stand that made the screen fully stable in its position. Having additional USB ports was a further attraction as many monitors lack in that feature, which ultimately creates a great fuss of extra wires and sockets. The only problem was with the brightness setting, which when increased somewhat affected the display. Other than this, more than 70 percent of the people gave it a full 5 star review. Best gaming monitors under 300 has far as the price is concerned. 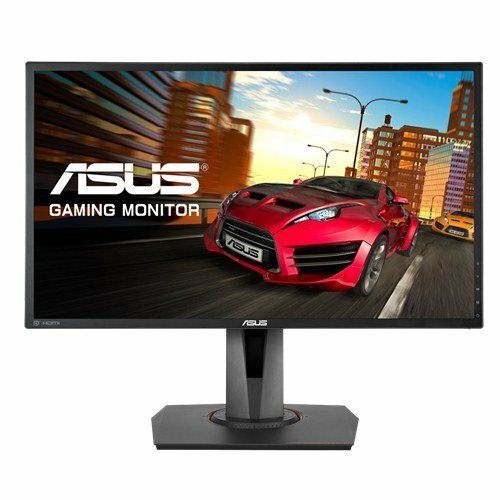 Asus has managed to come up with a super affordable gaming monitor consisting of all the features that other gaming monitors have and all that in a very affordable price. It has a fat response time of 1ms, Game fast input technology and two HDMI ports, which all lead to a trouble free game play and a 1920 c 1080 resolution guaranteed clear display. Eye care technology reduces the blue light and flicker to make sure that user doesn’t feel any pain while using the screen. The stand that comes along is strong enough to support the weight and even allows the user to tilt, swivel and adjust the height of the screen. The color performance is improved by game plus function. A fast refresh rate and 2W speakers put it right in competition with other brands. Gamers have specifically liked this monitor due to the classy outlook of the screen and stand both along with uninterrupted gaming. 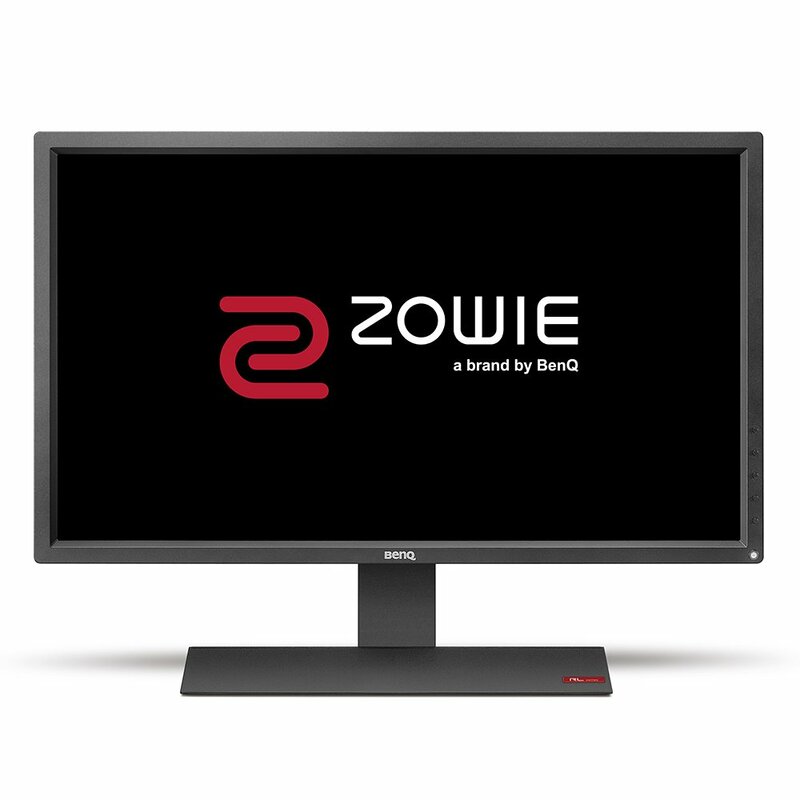 This monitor comes at an affordable price of just above two hundred bucks a bit, with a size of 24 inch built especially for the gaming community. It has a refresh rate of 144Hz and 1ms fast response time which makes gaming smoother and fast than ever. The Black equalizer works great because it allows the user to view things even in the darkest of scenes. Motion blur reduction is there to support fast moving scenes and play them without any interruption. Low blue light protects the user from eye strain that they might get due to continuous usage and the less flicker technology does the same job. This is the monitor you need to have if you want to enjoy seamless gaming. It provides with exactly the same features that any high end monitor would have. The frame rate has been kept the lowest to give users best experience. The display is highly flexible and allows the user to change its positions to set the perfect view. Customer responses were overwhelming and about 78 percent of the users gave it a full 5 star review. They were happy with the screen display and many of them said that unlike other monitors, they were able to enjoy their whole game without any unnecessary interruptions. The only two issues that users faced with the monitor was firstly with the stand not being that flexible and there was no display port within the monitor. Other than this, BenQ definitely lived up to the expectations. One of the gaming monitors under 300. This is a super wide gaming monitor under 300. 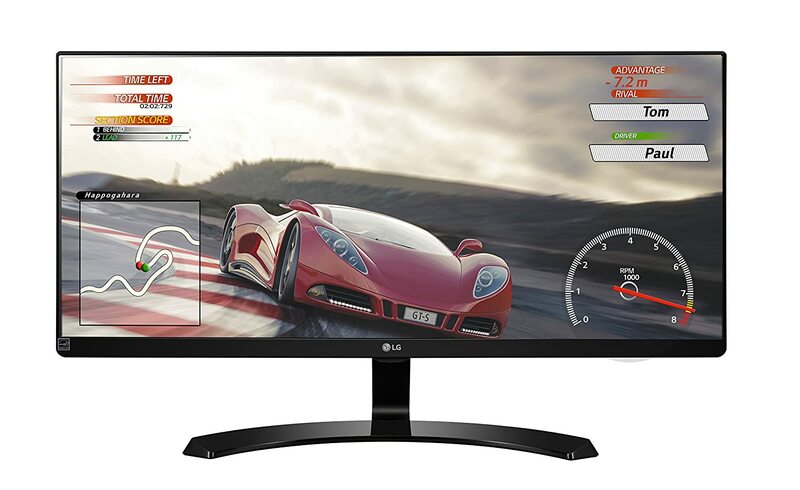 This is 29 inch and is probably the widest among all other gaming monitors (in this price category). The ultra wide aspect ratio of 21:9 increases the depth of gaming. A 1080p full HD resolution further ensures that all the colors are shown in their best quality. The display is better than many other monitors offering the crispest details. The standard color space of ideal color production is over 99 percent of sRGB. This makes it the best solution for gamers and even other interested people like photographers. The monitor also allows for a split screen option, this means that multitasking is not at all an issue on this monitor. One can enjoy playing a game on one screen and manage some official work on the other, work and entertainment therefore go hand in hand. Additional game mode enhances all related features with relevance to the game being played. Response by the users was great and they particularly loved that the huge monitor was at a very low price. The contrast ratio was exceptional and there was no problem of light leaking from the sides of the screen. The stand is flexible and can easily be adjusted to suit the user’s view. The only improvement that LG could have done was with the resolution to match with the size of the screen. Otherwise, the overall look is very classy and with its slim design hardly takes up any space. All in all, about 71 percent of the users gave it a full 5 star review. They were fully satisfied. $300 is a pretty decent price point. If you are looking to get the best gaming monitors under 300, then you can get nice deals on monitors. Mot of these monitors are mid end gaming monitors offering some pretty sweet specs.